PANDORA — Naomi Basinger is celebrating her 100th birthday. An open house was held April 13 at Hilty Memorial Home, Pandora. A card shower would be appreciated, care of 304 Hilty Drive, Pandora OH 45877. She was born April 16, 1919, in Lafayette to Harry E. and C. Chloe (Williams) Shrider. On July 13, 1940, she married Orville Basinger, who died Jan. 25, 1998. She has two children, Lynn (Betty) and Jane (Mark) Kinsinger. She has five grandchildren, 13 great-grandchildren and three great-great grandchildren. 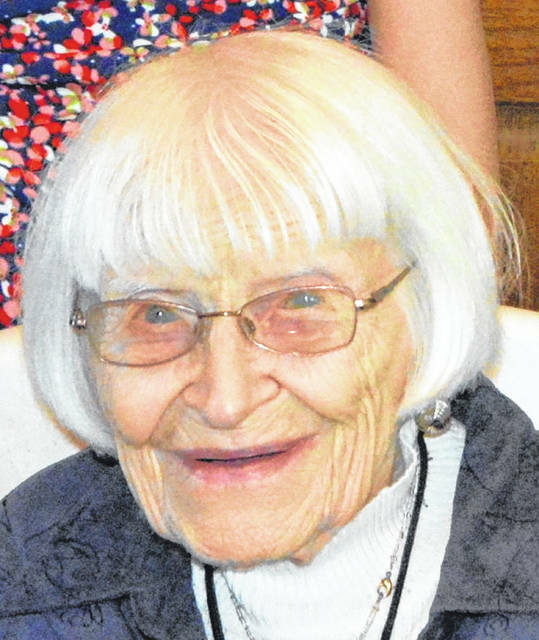 She had worked at Westinghouse, Lima, and retired from Triplett. She loves family visits, especially from her great-grandchildren. She stays active, attending the various programs and enjoys singing at church services at the home. She is an avid bingo player.